During the fall of 1980, the nationwide shortage of registered nurses reached crisis proportions. Nurses were leaving the profession in droves, enrollment in nursing schools was decreasing, and discontent was widespread. Discontent ranged from disillusionment with nursing as a profession to adversarial relationships with physicians and resulted in pronounced staffing shortages. This unfortunate situation was no more pronounced than in the VA system. When PL 96-330 was passed by Congress without direct input from VA nurses, a small group of dedicated nurses at the Hines VA Hospital in Illinois decided that it was time for action. This decision marked the birth of the Nurses Organization of Veterans Affairs. Earlier, in the spring of 1980, a proposal was drafted encompassing the concept of a nationwide professional nursing organization with an educational and legislative emphasis. Since it was founded, NOVA has grown to include VA nurses from all over the United States. These nurses have pursued their goals resolutely and have been able to influence significantly our nation’s legislators on issues of veterans’ health care. January 2018 - NOVA's newly hired management company, Association Headquarters, began providing full service management for the association. Kristy Cohen became NOVA's new Executive Director. February 2018 - NOVA established a partnership with the VA National Center for Patient Safety. Wendy Morrish, MSN, RN, CNL, VHA-CM from that office presented a webinar titled “Crosswalk or Crosstalk: National Patient Safety Goals: It’s All of Our Business” by Wendy Morrish. March 2018 - NOVA’s 24th Annual Legislative Roundtable was held on March 16th at DAV Headquarters in Washington, DC. Participants were welcomed by Thelma Roach-Serry, BSN, RN, NE-BC, NOVA President. Teresa Acosta, DNP, MSN, RN, NOVA’s Legislative Chair, presented NOVA’s legislative agenda, followed by presentations from representatives from Veterans Service Organizations (VSOs), national nursing organizations, Congressional legislative staff members, and staff from the Office of Nursing Services (ONS) in the Department of Veterans Affairs. April 2018 - NOVA presented a webinar titled “Providing Meaningful Input for Your Proficiency for Nurse I Level 3 and Nurse II” by Connie Perry-Simon, RN, MSN, NOVA Nurse Emeritus. May 2018 - NOVA presented a webinar titled “Demystifying Evidence Based Practice: Selecting a Nursing Model” presented by Janet E. Abbott Eckhart, EdD, MSN, RN. June 2018 - NOVA and its VHA partners raised concerns with several of provisions of the VA Mission Act of 2018 (P.L. 115-182) which was signed into law on June 6, 2018. July 2018 - NOVA presented a webinar titled “Evaluating Your Input for Your Proficiency for Nurse II” presented by Nancy Claflin, DNP, MS, RN, NEA-BC, CENP, CCRN-K, CPHQ, FNAHQ. August 2018 - NOVA announced the 2018 Scholarship Winners. The winner of the $3000 Vernice Ferguson Scholarship was LaVeChelle Pillers. The winner of the $3000 Catherine Rick Scholarship was Brenda Barker. The winner of the $3000 Anthony Principi Scholarship was Danielle Alderman. The winner of the $3000 Jesse Brown Memorial Scholarship was MeKanya Rayford. The winner of the $1500 Mary Raymer Scholarship was Nancy Fitting. A NOVA scholarship of $1500 was awarded to Andrea Lee. September 2018 - NOVA presented a webinar titled “Providing Meaningful Input for Your Proficiency for Nurse III” by Connie Perry-Simon, RN, MSN, NOVA Nurse Emeritus. October 2018 - NOVA's 38th Annual Meeting, “Nursing Strong: Evidence-Based Care for America’s Heroes,” took place at the Hilton Richmond Hotel and Spa/Short Pump in Richmond, VA from October 11 - 13, 2018. NOVA celebrated the 10 year anniversary of Nurse Emeritus at the meeting. November 2018 - NOVA held a Town Call with members of the NOVA Board of Directors and staff. The call provided opportunities for members to ask questions and receive important information and updates from NOVA. 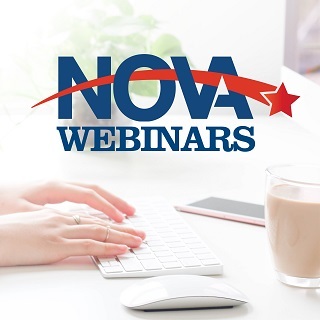 December 2018 - NOVA presented a webinar titled “Congress and Advocating as a VA Nurse” presented by Teresa Morris, NOVA Director of Advocacy and Government Relations and Nancy Claflin, DNP, MS, RN, NEA-BC, CENP, CCRN-K, CPHQ, FNAHQ.